Should We Regulate Marijuana Like Alcohol? The phrase ‘regulate marijuana like alcohol’ has become very popular in the last decade. And why shouldn’t we try to regulate it like alcohol? 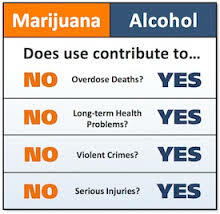 Marijuana is less addictive and safer than alcohol, which has a tendency of stimulating aggressiveness in its users. Therefore, telling voters to support regulating marijuana like alcohol has resulted in a lot of traction in the minds of those voters. The state of Oregon is the first state to attempt the process of regulating marijuana like alcohol, with the Oregon Liquor Control Commission (OLCC) tasked with figuring out all of the rules, processes, and procedures it will take to achieve that objective. Marijuana legalization in Canada seems to be inevitable after this past election. It is no longer a question of “if”, but a matter of when and how this will take place. How should marijuana be regulated in Canada? Should it be similar to how alcohol is regulated? That’s what some officials in Canada are calling for. As Canada’s new government struggles with how to implement marijuana legalization, at least a few public figures are urging officials to allow sales through the country’s tightly controlled liquor stores. In the central Canadian province of Manitoba, the Liquor & Gaming Authority expects to serve as a marijuana regulator and is now preparing for that role, according to the Winnipeg Free Press. There would be some benefits to regulating marijuana like they regulate alcohol. If they were to regulate it that way in the U.S., they would save 7.7 billion in enforcement costs as well as create a 6.2 billion dollar tax revenue. This revenue could help pay for education, treatment programs and an effective drug prevention program. It could also open the door for a more effective police department and judicial system that currently deals with over 700,000 marijuana related arrests every year. It could also potentially end prisons causing more harm to a marijuana consumer than the drug itself. This type of regulation also lends itself to removing barriers to research marijuana’s medicinal benefits.